This is the second of what we hope will be an ongoing series of the adventures of Aya in the Ivory Coast of three decades past. If you have yet to enjoy the original volume, Aya, you might want to consider starting there. 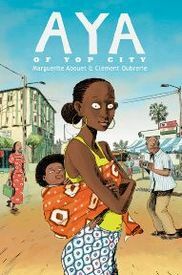 In either case, to experience Aya's unique appeal, click here, for a nice PDF preview of Aya of Yop City. Is This How You See Me?